A variety of items are attached below. You can see these and other items that are not in these dispatches if you "like" this page: www.facebook.com/TomGrossMedia. Chris Gunness, the former BBC correspondent who is now the lead spokesperson for the Jerusalem-based UN agency advocating on behalf of Palestinians, has (according to the New York Times) denied claims that a photo he has been distributing has been touched up. The UN is helping to organize a campaign to display the photo on a giant screen in New York’s Times Square. Tom Gross adds: Whether or not the present photo has been doctored, it is unsurprising that so many people are quick to disbelieve Chris Gunness, and international news agencies. There have been many cases of major news agencies putting out distorted or staged photos and film footage, often in the Middle East, and to portray Israel in a negative light. For example, after the 2006 Lebanon War Reuters and AP later admitted their local Lebanese photographers had distorted photos (the photographers were then sacked). Last year, the overall winner of the 2013 World Press Photo, which was from Gaza, was widely accused of being a staged photo. Please see here. Chris Gunness has on several occasions made sensational claims leading to headlines around the world (such as “UN accuses Israel of herding 110 Palestinians into a house then shelling it, leaving 30 dead”, London Daily Mail, Jan 9 2009) which were later proven to have been mistaken. The BBC World Service and UNRWA both receive funding by the British government, and they are meant to be impartial. Tom Gross adds further: Gunness has denied the picture from Syria he is currently promoting, has been touched up. 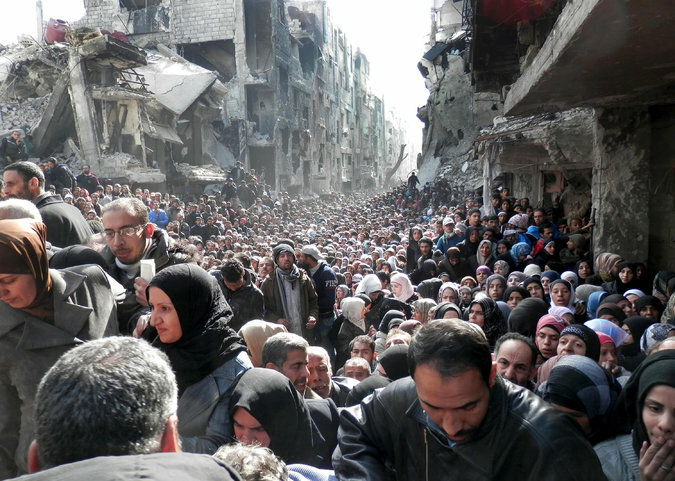 But in any event, Syrians of all ethnicities (including Palestinian Syrians) are certainly suffering greatly and the international community needs to do much, much more to help them. What has not been reported on sufficiently, in my view, is that Israel last year offered to allow several thousand Palestinian-Syrians to move to the West Bank – but Palestinian Authority President Abbas refused, demanding they should move to Israel proper. In other words, Abbas would rather let these Syrian Palestinians suffer at the hands of the Assad regime, than allow them to live in the West Bank. Several commentators (such as Tom Rose) have pointed out that at the same time that the U.S. State Department is relaxing entry requirements to visa applicants from the Arab world (including some people with connections to extreme Islamist groups in countries like Egypt and Syria), and also letting Russian President Putin know that any sanctions against travel to the U.S. placed upon those responsible for Russia’s incursion in Crimea will be limited to a “few dozen” named individuals, it is dramatically increasing its rejection of Israelis seeking tourist visas to visit the US. Israeli officials say they believe that the unexplained increase that is making it difficult for many Israelis to go on holiday or visit friends and relatives in America, is part of a range of measures the Obama administration has taken to punish and isolate Israel. The State Department has confirmed that there has been a 400% increase in the visa refusal rate for Israelis since President Obama came to office, and last year Israel was removed from the State Department’s visa waiver program whereas citizens of dictatorships like Saudi Arabia and Qatar (both of which support extreme Islamists in Syria and elsewhere) remain eligible to participate in the U.S. visa waiver program. Earlier this week, Britain’s Channel 4 news described U.S. Secretary of State John Kerry as “talking to his Russian counterpart so gay lover of”. It is amazing this is what the spell check did to the name of Sergei Lavrov, the Russian foreign minister. The Norwegian Cruise Line company said yesterday it would no longer dock in Tunisia (the supposedly more liberal country at the forefront of the “Arab Spring”) after the Tunisian government last Sunday refused to allow Israeli passport holders and other Jews to disembark from the Norwegian cruise ship, Jade. The first issue of The Prisoner’s Voice has been published at the Ma’asiyahu jail in central Israel. The paper, written by and for prisoners, complains that Israel’s already very liberal prison system (where both Israeli and Palestinian inmates for example, get funding to do PhDs) is not liberal enough. An article in the new magazine claims that they should get the same rights as prisoners in Norway, who are allowed to go fishing and receive free sessions with personal fitness trainers. The magazine also includes interviews and profiles of individual prisoners and prison staff, cooking recipes, and relationship advice. From this week, 80,000 Palestinian commuters in East Jerusalem will enjoy free Wi-Fi on more than 100 buses. Both Israelis and Palestinians are more advanced than most places in the world when it comes to hi-tech and free Wi-Fi. Tel Aviv was the first city in the world to offer free Wi-Fi throughout the city. Over 80 percent of Palestinians in East Jerusalem own iPhones, Samsung Galaxies or other smart phones. Israel this week put on display the enormous arsenal of Iranian weapons that were seized from the Klos-C ship which was intercepted by Israel off the coast of Sudan en route to Gaza. There were more than 100 containers on board, and no doubt the hundreds of missiles capable of hitting Tel Aviv and Jerusalem and the hundreds of thousands of bullets and other weapons in them, would have been used to murder Israelis. Israel’s elite C4I Unit are being credited as the unsung heroes of the exceedingly complicated, months-long mission that led to the dramatic high-seas capture of the Iranian arms cache some 1,500 kilometers from the Israeli coast. Tom Gross adds: Given the current international negotiations with Iran, an enormous Iranian arms smuggling operation to terror groups ought to have been news regardless of Israel. Have you heard about this in the Western press? Have you seen Catherine Ashton mention it during her visit to Iran? Have Obama and other leaders condemned this? Instead Ashton arrived in Tehran to discuss closer cooperation with the regime in future, with her head cloaked in a dark scarf so as not to offend (on the day after international women’s day) the regime, even though millions of ordinary Iranians are pleading with the West to make a stand against the theocratic dictatorship in Tehran. To mark International Women’s day last weekend, I want to draw attention to an Indian-based charity (“Stop acid attacks”) that I have been supporting for some time. I am glad they are now getting international recognition – including a hug (in the Facebook photo below) from Michelle Obama last week – for their incredible work dealing with this terrible and growing problem. In order to provide for better functioning and more stable government, the Israeli Knesset yesterday (after decades of being urged to do) passed a new law raising the minimum threshold from two percent to 3.25 percent of votes needed for a party to gain seats in the Israeli Knesset. The law will also allow for only a maximum of 19 government ministers and four deputy ministers to the cabinet (still too many in my view, since large governments become unwieldy and expensive). (One recent Israeli government had 32 ministers and eight deputies, all with large staffs and budgets.) Under the new law, a government wishing to appoint more than 19 ministers would have to obtain 70 votes in the Knesset to do so. The new law will also make it harder for governments to be toppled mid-term. The law changes the “no-confidence” process through which 61 MKs can topple a sitting government through a simple vote in the Knesset. The previous procedure allows no-confidence motions to be presented in the Knesset almost without limit – and indeed, there have been three or four tabled every week by various opposition parties. This is one reason Israel has seen 33 governments in 65 years. The bill also changes rules for campaign finance to create disincentives for MKs to splinter from their parties once they are elected to the Knesset. Under the new law, a Knesset faction must have at least two MKs to win public campaign funding, so an individual Knesset member may now think twice before going to start his or her own party halfway through a Knesset term when elected to another party. The opposition Labor party and ultra-Orthodox parties vehemently rejected the bill. This week the government is also going to attempt to pass the Equal Service Bill to draft ultra-Orthodox Jewish men into national service from 2017, and a Basic Law requiring a national referendum for withdrawal from Israeli sovereign territory in the framework of a peace agreement (i.e. to enable Israel to make land swaps with territory in pre-1967 Israel). All of the countries are members of the Gulf Cooperation Council (GCC) and this is their most public dispute since the GCC, an alliance of monarchies established to counter growing Iranian influence in the Gulf, was set up in the 1980’s. Qatar’s cabinet expressed “regret and surprise” at the decision but said it would not bring its own ambassadors home. Did the Mossad Blow Up the Malaysian Airlines Jet? Some are saying that the Mossad and IDF were really behind the Ukrainian revolution, while Ukrainian ultra-nationalists are saying they hear Putin is now working for Mossad and a “Jewish mafia” is behind the take-over of Crimea.